What if pasta salad were more sweet than savory? That’s how it is in this recipe, a perfect way to make summer last a little longer (summer ends this Saturday, September 21st). 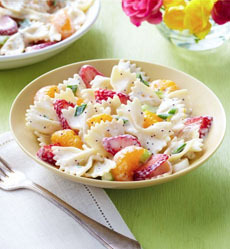 Creamy lemon poppyseed dressing, mandarin oranges and fresh strawberries create this refreshing twist on pasta salad. Serve it as a first course, or as a main course for lunch with some added chicken strips. Prep time 10 minutes, cooking and cooling time total time 1 hour. Makes four 1-cup servings. 1. COOK pasta as directed on package, omitting salt. Drain and cool. 2. MIX dressing and mayonnaise in medium bowl. Add pasta and onions; toss to coat. Gently stir in fruit. 3. REFRIGERATE 1 hour or longer. Serve with dressing (recipe below). Save 50 calories and 6 g fat per serving by preparing with reduced fat mayonnaise. Optional additions: almonds or walnuts; avocado; blue, goat or feta cheese. Combine dressing, mayo, cooked pasta and onions in large bowl. Combine oranges and fruit in separate bowl. Refrigerate up to 8 hours. Add fruit to pasta mixture up to 1 hour before serving. Keep refrigerated. 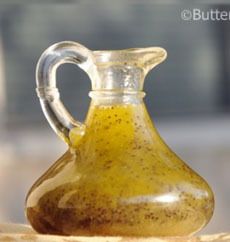 Lemon poppy salad dressing. Photo © ButteryBooks.com. 1. WHISK together vinegar, lemon juice, mustard, honey, onion powder and salt. 2. DRIZZLE in oil, whisking constantly until combined. Whisk in poppy seeds.